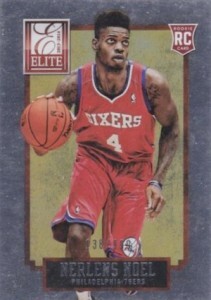 A significant injury meant that Nerlens Noel had an exceptionally long wait before finally stepping foot on a court in an official NBA game. 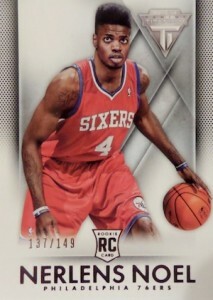 Now that he is all healed up, Nerlens Noel has made his league debut and his cards are starting to move again. 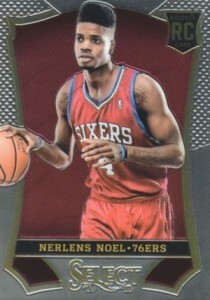 Shop for Nerlens Noel cards on eBay. 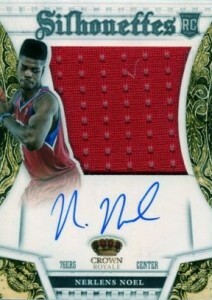 Following his senior year of high school, Nerlens Noel was one of the top recruits in the country and elected to play basketball for the University of Kentucky. 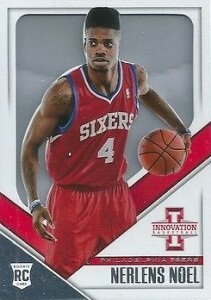 Although he put forth an impressive freshman year, Noel suffered a torn ACL near the end of the regular season. While it ended his season prematurely, his success was still recognized with multiple accolades, including First-team All-SEC, All-SEC Defensive Team, All-SEC Freshman Team, SEC Rookie of the Year and SEC Defensive Player of the Year. 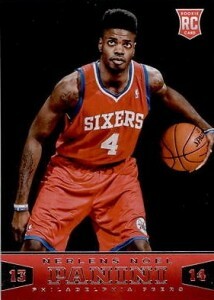 In spite of the injury, Noel still decided to leave school for the NBA after one year. 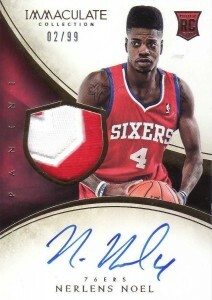 Widely considered the top overall pick in the 2013 NBA draft for most of his freshman year, the injury caused enough concern for teams that Nerlens Noel dropped to the sixth pick. 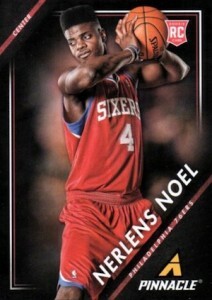 While New Orleans was the team that selected Noel, he was soon dealt to the Philadelphia 76ers in exchange for Jrue Holiday. Then came the waiting. 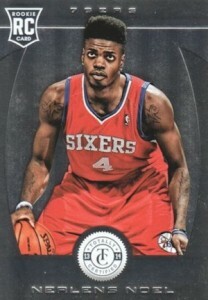 The weeks turned into months, and he ultimately missed the entire 2013-14 season. 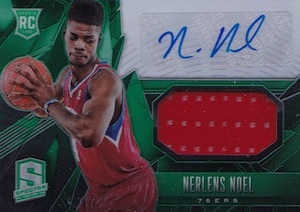 Fans and collectors hoped that the year off would allow Nerlens Noel ample healing time and that appears to have been worthwhile. As one of the few bright spots on a bad team, Noel has shown quick progression and already looks to be a future All-Star. 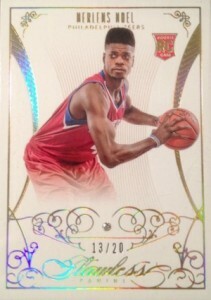 Because he missed his entire first year, the league still considers him a rookie in the 2014-15 season and he is eligible to win the NBA Rookie of the Year award, similar to Blake Griffin in 2010-11. 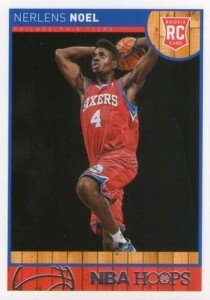 The following visual guide offers a look at all the Nerlens Noel rookie card options. 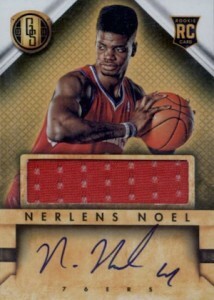 Collectors should be aware that Noel signed an exclusive deal with Panini, so that is the only place to find his cards. The total checklist features a wide variety of options that will fit into any budget. The most popular cards are his signed rookies, with the National Treasures and Immaculate Collection cards commanding the most interest. 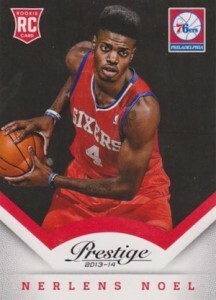 His Gold Standard rookie looks to to be the best overall value when you consider the on-card signature and jersey piece. 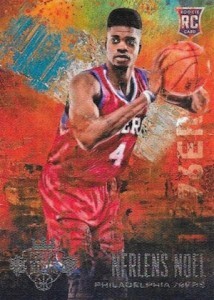 There are also many budget options and several numbered base cards. 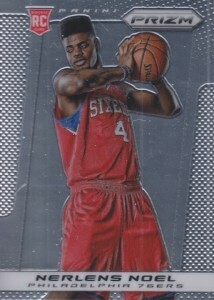 Click on the image or listing to shop for specific Nerlens Noel rookie cards on eBay. 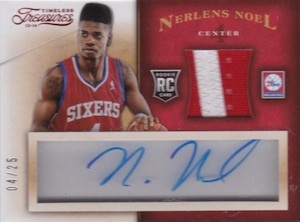 NERLENS NOEL 2014 GOLD STANDARD ROOKIE AUTO AUTOGRAPH RC JERSEY CARD! 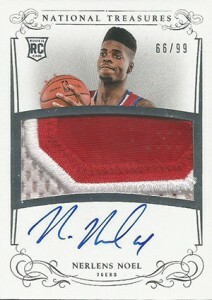 2013-14 National Treasures Nerlens Noel RPA #58 99 BGS 9.5 w 10 Auto GEM MINT! !